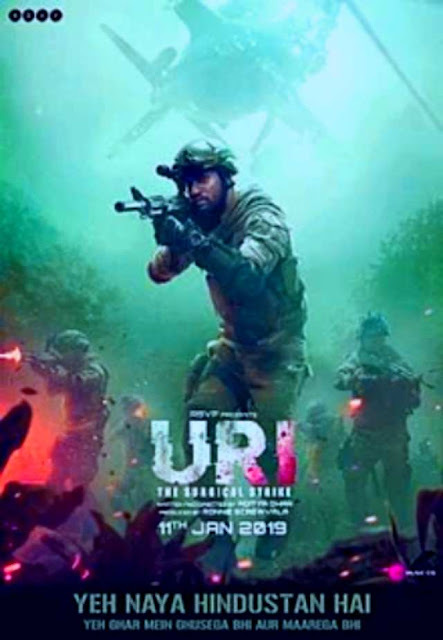 Uri: The Surgical Strike is a 2019 Indian action movie written and directed by debutant Aditya Dhar and produced by Ronnie Screwvala under his banner RSVP Movies. Starring Vicky Kaushal, Paresh Rawal, Mohit Raina and Yami Gautam, the movie is based on the 2016 Indian Army's surgical strikes on Pakistan Administered Kashmir as a retaliation for the Uri attack. It was theatrically released on 11 January, 2019. At around 5:30 a.m. on 18 September, four militants attacked an Indian Army brigade headquarters in Uri, near the Line of Control in a pre-dawn ambush. They were said to have lobbed 17 grenades in three minutes.19 army personnel were killed during the attack. An additional 80-100 army mans were reported to have been injured. A gun battle ensued lasting six hours, in which all four militants were killed. Combing operations continued to flush out additional terrorists thought to be alive. Most of the army mans killed were from the 10th battalion, Dogra Regiment (10 Dogra) and 6th battalion, Bihar Regiment (6 Bihar). One of the injured army mans succumbed to his injuries on 19 September at R&R Hospital in New Delhi, followed by another soldier on 24 September, bringing the death toll to 18. The casualties were primarily believed to have occurred as a result of non-fire retardant transition tents. This was the time of a troops shift, whereby troops from 6 Bihar were replacing troops from 10 Dogra. The incoming troops were housed in tents, which are normally avoided in sensitive areas around the LOC like Uri. The attackers snuck into the camp, breaching heavy security and seemed to know exactly where to strike. Seven of the personnel killed were support staff, including cooks and barbers.